"On the stump, Frasier sounds more Republican than Democrat"
Frasier is against labor rights. At the Gallivant's Ferry event in May 2010, Frasier told the hundreds in attendance "I don't want to be bogged down by unions." At an Horry County party event in October 2010, Frasier told Democrats that labor unions and their members should not have the right of collective bargaining, even though that's the primary function of labor unions. At a North Myrtle Beach forum in October 2010, Frasier told the public to vote for an amendment that would make it more difficult to create a labor union. Frasier is against programs that benefit low income families. In 1994 advertisements, Frasier said welfare should be replaced with "workfare." In a 2010 ad, he listed "creating alternatives to welfare" as a platform in his campaign. Frasier is against health care. In an interview with the Post & Courier in October 2010, Frasier said he was uncommitted to the Affordable Care Act ("Obamacare"). He also said he didn't know much about Obamacare at that time, even though it had been passed by Congress earlier that year. 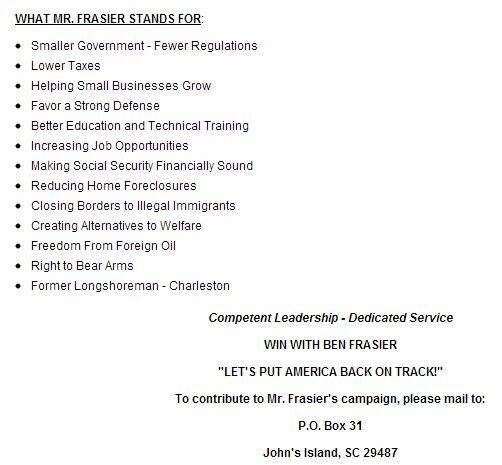 Frasier told "Campaign for Liberty" in 2010 that he would oppose any national health care system, including a public option for insurance. At a Myrtle Beach event in October 2010, Frasier said he didn't support the Affordable Care Act. Frasier favors tax benefits for the rich over helping citizens in need. At a Georgetown event in September 2010, Frasier said "we have to stop taxing the rich," even though the United States has the lowest taxes on upper income of all developed nations. In October 2010, Frasier told the Post & Courier that he favors the "Fair Tax" program, a national sales tax to replace income tax which would only benefit the wealthy, and which would increase total taxes on middle class - even poverty - by as much as 30 percent. At a Mt. Pleasant candidate forum in October 2010, Frasier said "we cannot tear down the rich to help the poor." Frasier is against safe gun ownership. At Gallivant's Ferry in May 2010, Frasier told the audience "it's great to be armed." He then sarcastically opened his jacket and slowly turned around, saying "don't worry - I'm not carrying anything." 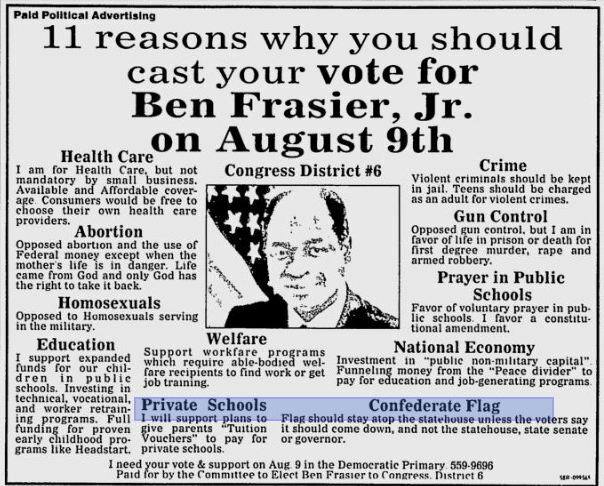 In campaign advertisements throughout his candidate history, Frasier listed opposition to any type of gun control in his platform. In a 2010 candidate survey, Frasier said he would vote against any legislation that would allow the federal government to restrict the sale or use of weapons. Frasier is against public education. At Gallivant's Ferry in May 2010, Frasier said we should give public school funds to private schools. In many of his campaigns, Frasier promoted "tuition vouchers" - tax breaks and even state public school funds to pay for tuition at private schools. Frasier doesn't care about our coastline. In 2008, Frasier told The Myrtle Beach Sun that he supported offshore drilling off the coast of our South Carolina. Frasier lists a segregationist to be his inspiration. 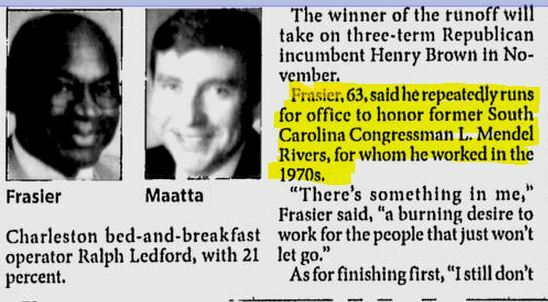 In 2006 the Post & Courier reported that Frasier said he "repeatedly runs for office to honor former South Carolina Congressman L. Mendel Rivers(.)" That former congressman was known to strongly favor segregation in public schools, however, and was also opposed to the Civil Rights Act. Rivers also tried to impeach a Charleston judge who ruled that blacks should be able to vote in the Democratic primary elections. Frasier is against a woman's right to choose. In a campaign advertisement, Frasier specified that he is against abortion. Frasier supports the "Big Brother" style of government invasion of privacy that was in the Patriot Act. 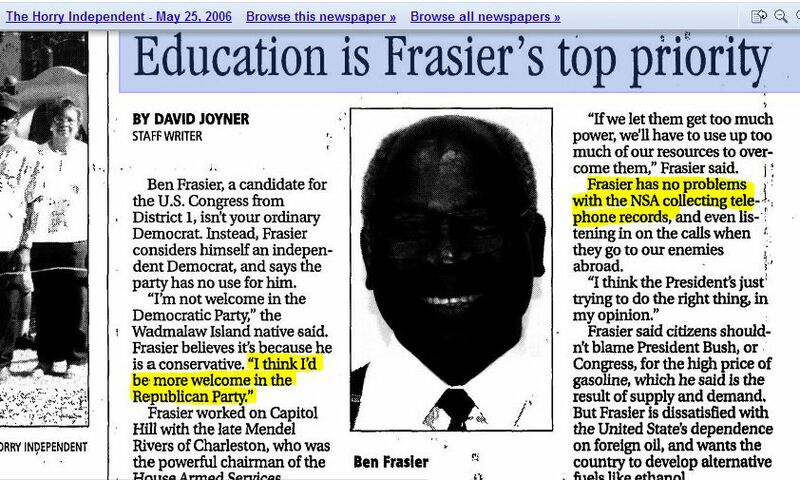 A 2006 article on him by the Horry Independent says "Frasier has no problem with the NSA collecting telephone records(.)" 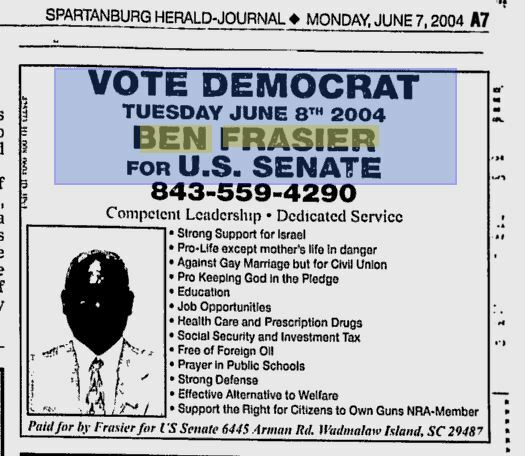 Frasier is supported by non-Democratic organizations. In 2010, Frasier was given a grade of "A" from the National Rifle Association's Political Victory Fund. Local Republican media agree that Frasier could just be a Republican plant. "Why would Republicans 'plant' Frasier in the Democratic primary? Easy: He’s black, and if he’s able to siphon enough of the black vote it could force Democratic frontrunner Elizabeth Colbert-Busch to waste time and money competing in a runoff election." Frasier has been supported by local Republican media. "Coupled with his anti-interventionism and border enforcement positions, Frasier the Democrat, is well to the Right of Republican Presidential nominee John McCain and his little buddy Lindsey Graham." In his column, Hunter appears to encourage Republicans to participate in that year's Democratic primary. "What sort of fool would urge conservatives they 'gotta vote Republican' to keep 'damn Democrats' like Frasier out of office? I would vote for a Democrat like Frasier 10 times before I pulled the lever for Republicans like Bush, McCain or Graham once. Not because I’m a liberal – but PRECISELY because I’m a conservative." And Frasier himself has publicly stated that he's no true Democrat. One of Frasier's campaign ads from 1994.